An artful garden sits amid four buildings, the headquarters of The Westervelt Company in Tuscaloosa, Alabama. Formerly known as Gulf States Paper Company, the company’s recently retired president Jack Warner served in Burma during World War II. 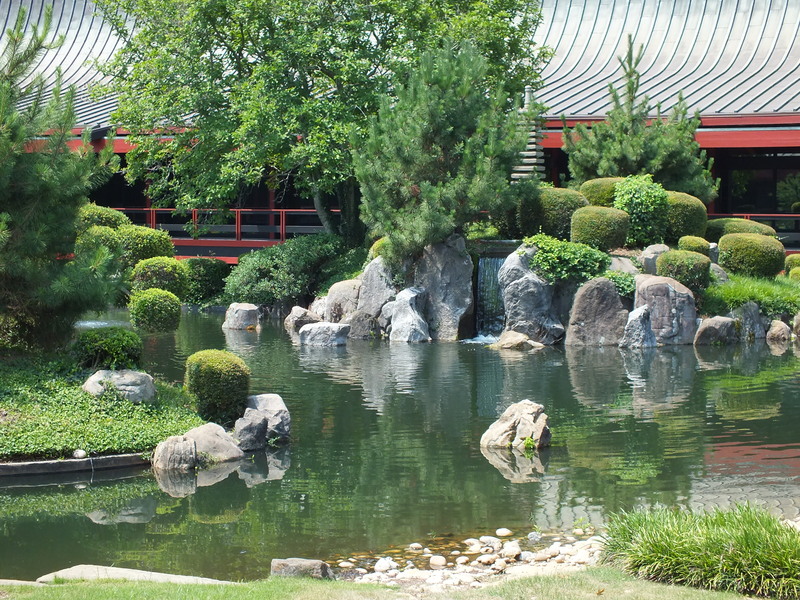 His time there and his frequent travels to Japan informed the design of the corporate headquarters and garden. 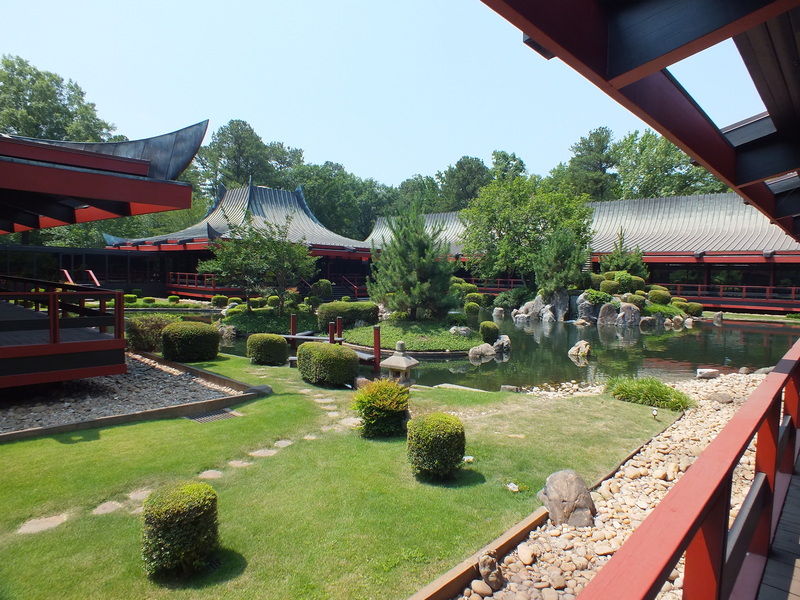 All four buildings are connected by exterior walkways offering varying views of the central garden, inspired by gardens at Katsura Imperial Villa in Kyoto, Japan. The buildings also house the Tuscaloosa Museum of Art, home of the Westervelt Collection, an extensive collection of paintings, furnishings and sculpture from around the world. 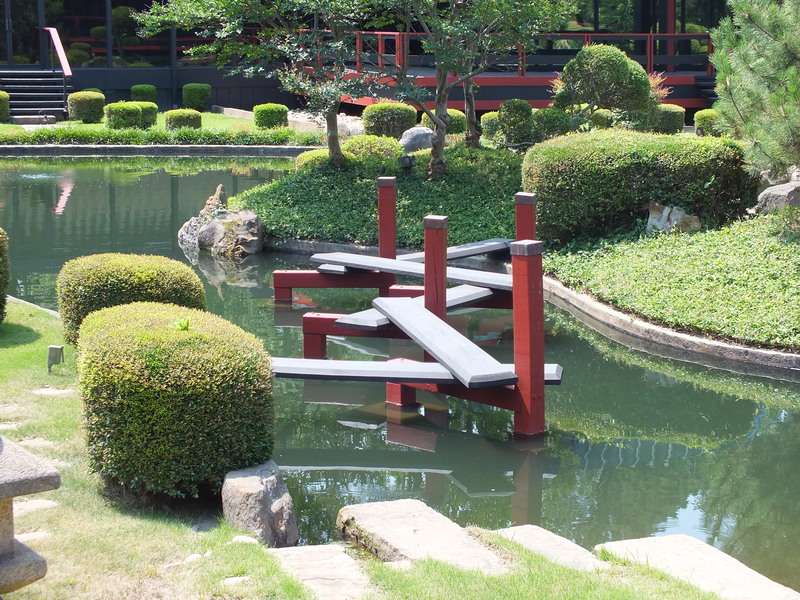 Garden construction began with construction of the office building in 1969 and both were completed in 1972. We were told that Mr. Warner closely directed landscape architect David Engel to achieve his vision — a garden in which quietude brings a sense of the oneness of all: heaven, earth and man. “We begin to feel our relationships to all the universe, where everything is forever changing in form, ever renewing,” according to an old brochure provided by the company. The entire pond was recently drained and leaks repaired. Koi have not been reintroduced to the pond. Several small goldfish were visible on this visit. Arrangements to visit the garden and the art collection must be made with the company. Thanks Jake. The diverse offices at The Westervelt Company in the four buildings surrounding this garden certainly offer the most enjoyable working environment. Then there’s the plus of the art collection. A wonderful gem. More photos will come later when Bill Eger finishes his work on his Nikon images. I’ve posted just a few of my Fujifilm and iPad snapshots as we go along. When I was young, my father took me to the gardens when it was Gulf States Paper. I remember how beautiful and peaceful it was. The buildings had glass walls onto the gardens so everyone could enjoy it. I don’t know if it is still the same, but I would like to visit again. The garden still is surrounded by company headquarters. Arrangements to visit must be made in advance. There is an opportunity to visit during a monthly art event. September 2018, We just learned the monthly art events have come to an end.